Jim Gavin: "There's a lot of shadow boxing going on the next couple of weeks until the league finishes." 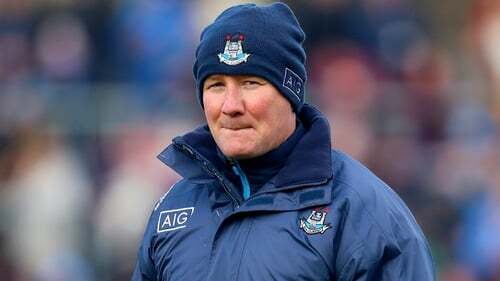 Dublin boss Jim Gavin believes the controversial hand-pass rule should have been kept for the league, and said managers should not have a "soap box" to change any decisions handed down by the GAA. The Sky Blues lost their Allianz Football League Division 1 opener against Monaghan in Clones 2-13 to 1-13 on Sunday afternoon. Two Dubs - John Small and Robert McDaid - were sent to the sin-bin after picking up first-half black cards, and goals after the break from Shane Carey and Stephen O'Hanlon ultimately edged it for the Farney. Gavin had no complaints over the result, but he did air his opinion that the hand-pass rule endorsed by Central Council last November and trialled during the pre-season competitions should still be in existence. Though the hand-pass rule has been scrapped, the four other rules trialled during pre-season - the offensive/defensive mark, the 20m kickout, the mandatory forward sideline kick outside the 20m and the sin bin - do apply during this league campaign. "The league in some ways is an experiment," Gavin told RTÉ Sport's Brian Carthy. "There's a lot of shadow boxing going on the next couple of weeks until the league finishes because these rules obviously won't be there [for the championship]. "I've no issue with them at all. I probably would have suggested to just get on with it and put them in [for the league]. If the governing body decides to change the rules of the game I don't think managers should have a soap box to change them either way. "I made my feelings known on behalf of the team to the county board and they then represented the county of Dublin. From my perspective, I've no issue with them. "The only thing I would have said is maybe just get on with it and have the rules in for the championship. Some of our players have to go back and play Sigerson competition on Wednesday and then play with a different set of rules with club fixtures in the coming weeks. It's a little bit confusing for them." Gavin said the black cards changed the game's momentum but he was loath to make any excuses for this defeat. Next up for the All-Ireland champs is a clash with the Tribesmen at Croke Park. "I thought it was a really great workout for the team," Gavin added. "Overall Monaghan fully deserved the win. They're always strong this time of year and they carry that strength right throughout the championship. "Our boys, we're two weeks back today. They stuck at it to the bitter end. I can only be happy in that regard, That game today is worth a couple of weeks in training. Now we focus on a really tough game against Galway next weekend. "Two black cards went against us. That's the way the game goes. It was a great challenge for our guys."